– Before dawn, the fog, the trench prior to going out the gate to attack a battalion of NVA. Not a word uttered, just Marines weighed down with grenades, M72 Light Anti-tank Weapons, magazines for M-16s, belts of machine gun ammo. Warriors leaning against the red mud trench walls smoking cigarettes, the fiery ends like beacons at the edge of the world. And then out we go. – A mortar crashing between Staff Sergeant A and me, blowing both of us onto our butts. A chunk of shrapnel embedded in my head. In my mind, a sensation like the ripples one sees after a stone is tossed into a pool of water. A peaceful few seconds where I am not caught in a life-or-death sequence of savage events. 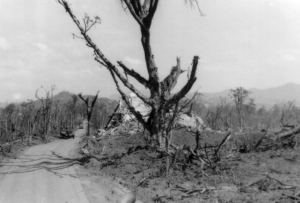 What Khe Sanh looked like at the end of the Siege. Photo courtesy of Mac McNeely. – At the top of the ridge, watching First and Third Platoons in the enemy trench. The noise, the smoke, the death. Getting doctored by the Corpsman while the Gunny worries if I’m alright. His hands shaking. And that shakes me up—that old battler being frightened. – Then into the enemy trench as Marines drop grenades and satchel charges into bunkers manned by the NVA. Our guys burning them out with flame throwers. – The dead littering the trenches, the shattered ground around. Sallow-faced dead men, and hard to know if they are theirs or ours. – Moving to the front of the battle, seeing a machine gunner thump an ammo humper with an M60. Me knowing that the humper didn’t cut the mustard. – Running past the Company Command Post that’s hunkered in a bomb crater. A North Vietnamese prisoner on his knees. A barrage of enemy mortars falling into the command post. Smoke clouds and mud eruptions. As the chaos clears, most of the Marines lying on the deck, dead or wounded, and if not, standing there drenched in blood. Someone shooting the prisoner with an M1911A .45 caliber pistol. The prisoner’s head jerking as he falls on his back. – Being out front in the blasted terrain where our advance ends, calling in an artillery barrage to protect us from their counter attack as we retire and gather our dead and wounded. – Being sent with Lieutenant M who has lost his radio operator. He keeps jumping out of the trench as we head back to the combat base. I keep telling him to get back in the trench because he will set off booby traps. But he is a lieutenant (although a very new one) and I’m an enlisted man. The next time he jumps out of the trench, he does what I feared. He trips a booby trap. A round erupts out of the ground and strikes him. Since his back is to me I can’t see what happens but it stops him cold and I know it is a white phosphorus round of some kind because the squiggly white guts of the thing come flying at me and some of them hit me in the face. I curse him. Not once, but many times and scold him as I approach to see what kind of damage he’s encountered. When I get even with him and then in front, I see the round has smashed him in the chin and lower jaw. It’s all white smoke and stink and Willie Peter (what we call white phosphorus.) I pack his face with red mud, since Willie Peter burns on contact with oxygen. I get him to the temporary aid station at the rear of the battle field. Willie Peter, I keep thinking at the time, is poisonous. I imagine that the white phosphorus that hit my face is burning deadly holes in me, so I pack red mud on the spots. I curse the lieutenant again. – On the way back into Khe Sanh Combat Base, the sky is yellow and filled with smoke. Explosions from our stuff, 105mm artillery and bombs dropped by our Phantoms. Blogger Ken Rodgers at Khe Sanh. Photo courtesy of the late Dan Horton. -Marines walking down the road and hitting the deck every time enemy rockets scream in. Hitting the deck jolts my head, my neck, my knees, jams the lip of my helmet into my upper spine. – I spy two Marines dragging a dead body. 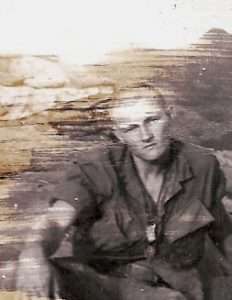 I get close and see the back of the corpse’s flak jacket and even though the dead Marine is dragged face down in the dirt, I know it is Corporal A, who begged me the night before to take his dog tags and a letter to his parents telling them he would die on this patrol. I didn’t take the letter or his dog tags. I screamed at him, “if you feel that way, it’s what will happen.” It bothers me that he is being dragged like that, like he is something not worth picking up and carrying. But I don’t do anything about it. Something about my failure to help him still haunts me and the shrapnel still resides in my skull.